Arthroscopic Bankart repair for the treatment of anterior shoulder instability is associated with a high rate of recurrent instability. Extracapsular stabilization of the glenohumeral joint with enhancement of anterior wall soft tissues may be an effective alternative treatment technique. 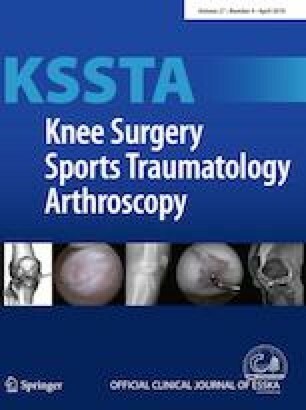 The aim of this study is to retrospectively assess clinical outcomes in the treatment of anterior shoulder instability using a novel technique of anterior extracapsular stabilization—”between glenohumeral ligaments and subscapularis tendon” (BLS). Patients with anterior shoulder instability who underwent surgical treatment with a novel arthroscopic BLS technique between 2008 and 2016 were eligible for inclusion. According to the level of glenoid bone loss, patients were separated into four groups. Group 1 comprised patients with GBL equal to or less than 5%, group 2 patients with GBL 6–10%, group 3 patients with GBL 11–15%, and group 4 patients with GBL > 15%. A positive outcome in this study was defined as full restoration of joint stability. To evaluate clinical results, preoperative range of ER and IR measured in 90 degrees of abduction were compared with ER and IR measured at final follow-up. Additional outcome instruments used consisted of the Constant Score and the Walch-Duplay Score. A total of 150 patients underwent arthroscopic BLS surgery. During the study period, 50 patients were lost to follow-up and 100 patients were available for final analysis. Mean patient age was 27.5 (± 10.3) years at the time of surgery. Mean duration of follow-up was 82.9 (± 29.4) months. At final assessment, 86 patients (86%) were categorized as having a positive outcome, with full restoration of joint stability. Recurrence of shoulder instability was observed in 14 (14%) patients, including 6 (6%) cases that were associated with major trauma. At final follow-up, the mean Constant Score was 88.2 ± 10.1, compared to 82.9 ± 9.1 preoperatively (p < 0.05). The mean final and mean preoperative Walch-Duplay Scores were 81.5 ± 18.9 and 52.2 ± 11.9, respectively (p < 0.05). There was no statistically significant limitation of external or internal rotation. The BLS technique has been shown to be an effective method to anterior shoulder instability in patients without significant glenoid bone loss. It was shown that this technique provides significant improvement in shoulder function without reducing shoulder range of motion. The technique had been approved by an ethical committee. IRB approval by the Medical University of Lodz RNN/258/13/KE.